These activities were designed and developed by Irene Liem. 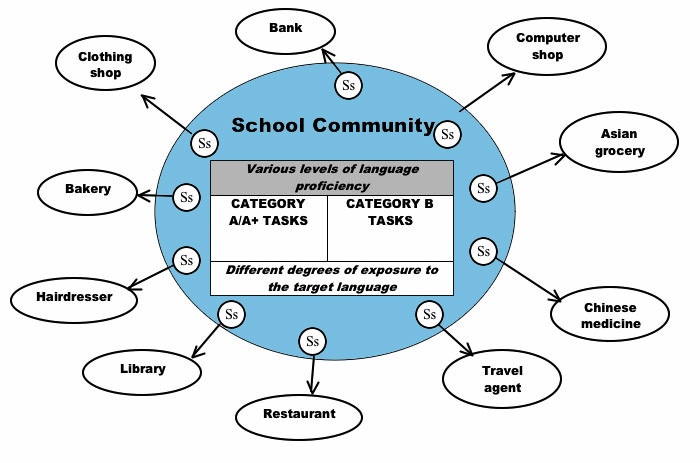 Above is a model of a mixed background class, using community resources as a springboard and context for learning a community language. Students with different levels of proficiency and degrees of background in the language participate in different activities. Click on the thumbnail to enlarge the image. There are two broad types of classroom organisation: teacher-centred and peer-based. Students are organised into small groups, each consisting of a mixture of students with different levels of language proficiency and a different range of language backgrounds. An ideal group size is between 4 to 6 students. It is big enough to include diversity but small enough for more interpersonal exchanges. Tasks are differentiated according to the various levels of language proficiency. While individual students on one hand tackle a task appropriate to their level of proficiency, they are also encouraged, through structured activities, to share their learning strategies, knowledge and skills in the target language with other members of the small groups as well as with the whole class. In schools where there are Advanced, Intermediate and Beginners classes at one horizontal year level, the possibility of them timetabled together at least once a week will provide the opportunity for greater sharing in mixed backgrounds groups, encouraging an environment of a learning community. As this module* is catering to a class or combined classes of mixed backgrounds students in an age-related horizontal year level, the syllabus is differentiated into three Categories of tasks so as to meet the learning needs of students at different levels of proficiency in the target language. Those in Category B tackle less complex tasks such as (i) (ii) (iii); those in Category A tackle more complex tasks such as (iv), while those in Category A+ tackle extension activities such (v). The aim of differentiation is to enable students to tackle tasks according to their current level of proficiency and at the same time extend beyond by working with others to achieve group tasks that require collaboration. The more advanced students will have the opportunity to take up leadership and teaching roles in the team, helping others while developing a new repertoire of linguistic, metalinguistic metacognitive and social skills. * The module aims to help students reach language proficiency level CSFII between 5 and 6 (Pathway 1) between 4A and 6A (Pathway 2). Games, activities using the local community as the context. How to ask for information using the local community as the context. Constructing a pamphlet promoting the local community. Students of each category work together in an integrated task. These activities involve going into the community and are placed in a sequence. The following are only suggestions as to the type of tasks that students can do - teachers can use their creativity to design activities that engage their students. Tell how to go from school to a specific shop/shops. Ask for at least 5 items of information from a specific shop. Help category B and A team members to fine tune their preparation for fieldwork. Students of categories A and B form a team and go out to the community. Observe and listen to Category A students' interaction with shopkeepers. Note-taking: writing down the conversation between student and shopkeeper. Support team members giving them the confidence to use the language. Category B, Category A and A+ students form a team of 4 or 5. Students go as a team to a shop, when Category B students are naming shops, asking and giving direction, Category A students can listen and check if the dialogue is correct. When Category A students are interacting with the shopkeepers, Category B students can observe and listen to the interaction, try to learn from their experience. Students from Categories A and B form a team and give a presentation to the whole class. Write a script for a role play showing how to ask and answer questions on direction to a shop selected by the team, it should also include an interaction with a shopkeeper. The role play should be presented orally to the whole class. Create a web page/ create a pamphlet/ write an article for school paper with information about, for example, the cheapest place for noodles or to get the latest hairstyle. Present the web page/ pamphlet/ article to the whole class. In combined classes, teachers from different classes come together and work as a team, sharing ideas, supporting each other in the effort to develop activities/tasks that will enrich the learning experiences of students. Differentiated Tasks As each group consists of students with a range of backgrounds in the language as well as varying levels of proficiency, tasks need to be differentiated to meet the needs of such a diverse group of students. While the less advanced student is given the basic grounding in the language, the more advanced is given more challenging tasks. Students within such a classroom will not be exposed only to what the teacher offers them, but to a range of metacognitive, cognitive, social and linguistic skills offered by their peers in class. Giving students the experience of using what they have learned in real-life situations makes learning relevant.